The NCAA tournament is down to just eight teams! The winners of this weekend’s quarterfinal matches will advance to the 2016 College Cup in San Jose, California. 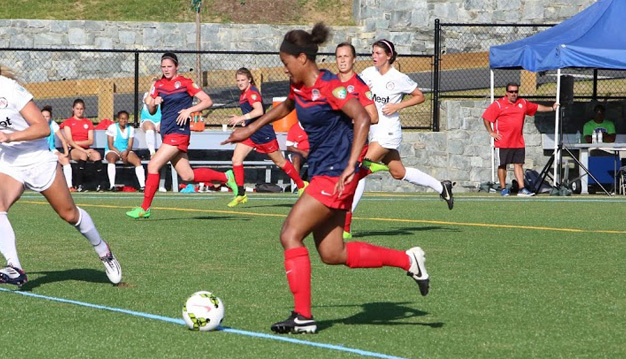 Six members of the 2016 Washington Spirit Reserves – Lizzy Raben, Krystyna Sikora, Kayla McCoy, Casey Martinez, Imani Dorsey, and Mia Gyau – play for the Duke University team that will face West Virginia University on Saturday, November 26 at 3 p.m. ET in Morgantown, West Virginia. Duke is the only team from last year’s College Cup that is still alive in the tournament. One of our hometown DMV teams – Georgetown University – advanced to the Elite Eight. The team faces Santa Clara University, alma mater of pro team member Alyssa Kleiner, at Shaw Field on the Georgetown University campus on Saturday, November 26 at 12 p.m. ET. Perennial women’s soccer power University of North Carolina, where Crystal Dunn made her mark in college soccer, will take on University of South Carolina on Friday, November 25 at 5 p.m. ET in Columbia, South Carolina. Getting it all started will be the first quarterfinal match between University of Southern California and Auburn University on Friday, November 25 at 4 p.m. ET in Los Angeles, California. If you’re looking to keep up with all of the NCAA tournament matches, give @EqualizerSoccer a follow on Twitter. Good luck to all the players and programs connected to the #SpiritFam!